This is the story of Buddy, a Chihuahua with a past but destined for greatness, and Jessica, his human partner in life. 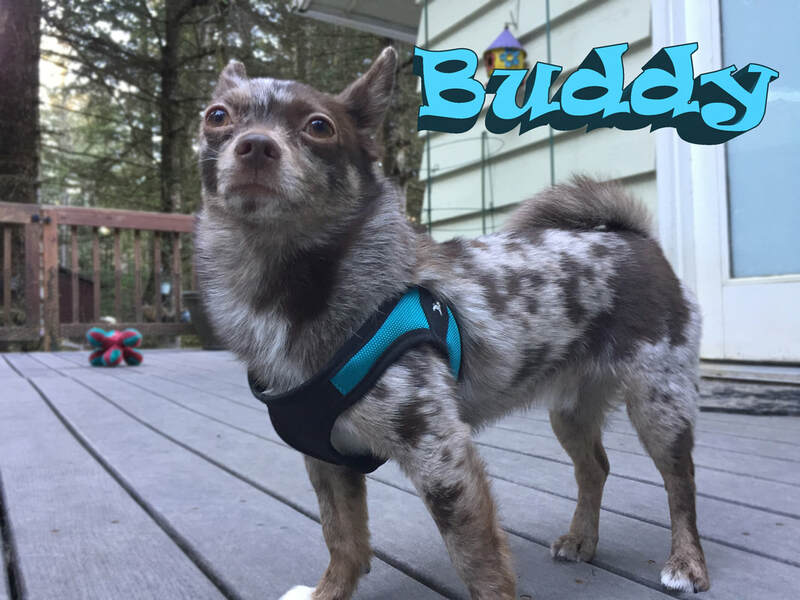 After multiple reports of neglect and cruelty, Buddy was picked up by Animal Control Officers and became property of Juneau Animal Rescue in January of 2016. The streets are not a good place for any dog, but Buddy’s small size made things especially difficult and stressful, however, his unfortunate situation was about to change. Jessica, with the help of her mother Diana, was looking for a small dog that could be trained to be a service dog (Jessica has autism and suffers with seizures from epilepsy). In June of 2016, Jessica visited Buddy at the shelter and the bond began immediately. They filled out the paperwork and by the end of the month Buddy and Jessica were headed off on a new adventure. Not knowing what to expect upon bringing Buddy home, Jessica and Diana were very surprised that Buddy was house-trained, especially since he had spent so much time outside prior to coming to Juneau Animal Rescue. Buddy was the perfect dog for Jessica, although neither of them would know that yet. Dogs who alert prior seizures happening can’t be trained to do this. It is a natural ability in some dogs. Something different happens to a person prior to the seizure. It is thought that dogs who alert pick up a scent the human body gives off before the seizure happens. Twenty minutes before Jessica has a seizure, Buddy will jump on Jessica’s chest so she knows that she needs to take her medicine immediately. As I sat in a coffee shop waiting to interview Jessica, I watched them enter and observed Jessica immediately picking Buddy up and wiping his paws before bringing him into the room. Buddy loves being outdoors and going on group trips with Jessie through ORCA (Outdoor Recreation and Community Access), which is part of SAIL (Southeast Alaska Independent Living). He and Jessie go on hikes and they both love kayaking. Buddy goes everywhere with Jessica. He provides comfort for her and helps keep her calm in stressful situations. Buddy has given Jessica a confidence she did not have before he came into her life. Buddy has helped to make Jessie more independent; she was able to take her first trip on her own without the aid of a care-provider. Buddy has Service Dog status but he has become so much more than a service dog. Buddy is Jessica’s best friend.